How is RĀZ Mobile better than text-to-give like I’ve seen used to help disaster victims? Why shouldn’t we just create our own mobile app or mobile website? I just need mobile giving for my upcoming event. Can you help with that? Where can I integrate my mobile site so supporters see it? What kind of donor information do we get? What does the donation processing fee cover? 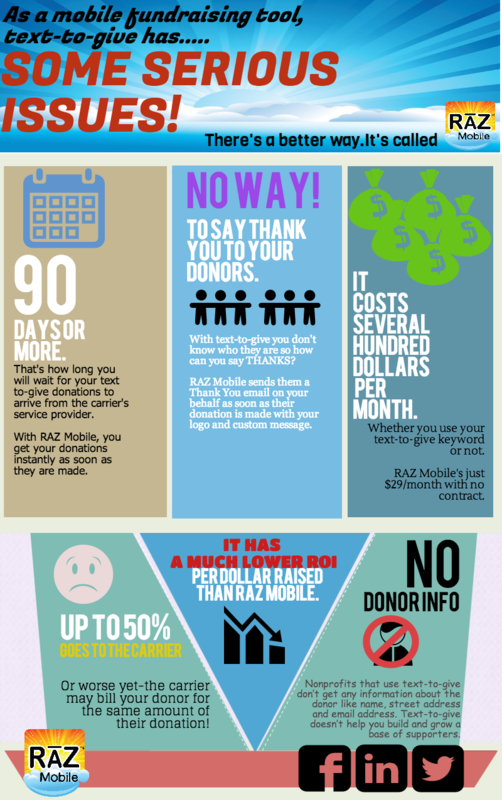 Is RĀZ Mobile secure for donors? Does RĀZ Mobile receive my donations and then pass them on? How does my RĀZ Mobile website look on a tablet or PC? You could do this, but it can be very costly and time-consuming. With today’s software technology, it’s really easy to create your own mobile website and to share it when you want in a wide array of channels and best of all-process donations securely and quickly. Estimates place the cost of creating an app or mobile website in the tens of thousands of dollars. And once created, you will then have to host and maintain these platforms, tacking on additional costs. For less than a dollar a day, this is all taken care of on the RĀZ Mobile platform. It’s very easy to get started with RĀZ Mobile. We’ve had client sites go live in an afternoon. There’s no setup fees or approval process. All you have to do is click, type and upload a few images to get started. You don’t have to know any programming language. It only takes a few minutes to create your account and then create your RĀZ Mobile site with some basic content. 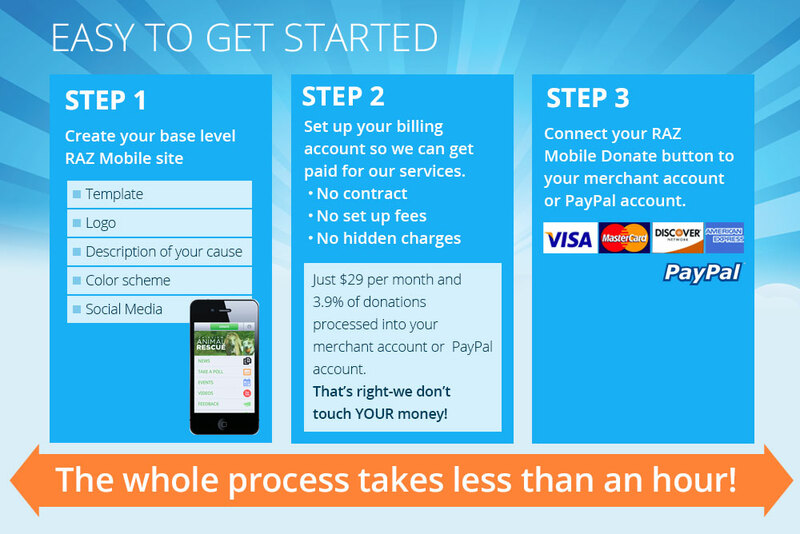 Then you set up your payment method and then the last step is to connect your donate button to your RĀZ Mobile site so donors can make donations to you. We can process donations into your existing merchant account or into your PayPal account. You bet! Even better is that your RĀZ Mobile website provides you an ongoing mobile presence just as you have an ongoing PC presence with your PC site. With so many using their mobile phones to search for many things including your cause, it makes total sense to use your RĀZ Mobile site for events and for reaching and engaging your supporters now and into the future at anytime and anywhere. Also, since so many access Twitter and Facebook from their mobile phones, you need an optimized mobile website like you get by using RĀZ Mobile in order to share content with your supporters and to let them make donations when they are motivated to do so. Don’t make your supporters pinch and swipe and squint around on your PC site on their mobile phone. With a RĀZ Mobile site, your supporters will get a great experience on their mobile phone and they will be able to engage with you again and again well into the future. We created RĀZ Mobile so that it could seamlessly integrate into everything you do today. You can add your RĀZ Mobile site QR code to all your printed material. You can send out an email that has a link to your RĀZ Mobile site in it for supporters that read your emails on their mobile phone. At live events you can ask supporters to text your RĀZ Mobile keyword that you choose when you create your account to the phone number you choose so that you can build a large base of supporters that want to get text messages from you. You can share your RĀZ Mobile site URL in social media. There’s really no limit to the places you can add mobile to your communications channels. If you need help please let us know. We love to provide great service! We have variable costs associated with features like text messaging, site hosting and delivery, donation processing and secure credential storage for donors that choose to create a PIN to use to make future donations really fast and secure. With the average cost of raising a $1 at 20 cents, RĀZ Mobile offers a significant savings with 3.9 cents for every $1 raised in any given month. We also use the internet-standard SSL processing so your donors information is always secure. In a word-NO! We were advised by our legal team and banking advisors that this sort of service is not the way to go. We also didn’t want to hold your money when you need it immediately to do the work you need to do. 100% of your donations go to your merchant account or PayPal account when the transaction clears the donor’s credit card. It looks great! With RĀZ Mobile, you get 3-screen optimization so you can have a great internet site for mobile phones, tablets and PCs. Click here to see for yourself. With one service, you are supplied with all you need to get a great web presence and the ability to share it with your supporters through social media, email, web ads, search, text message and more.